A large number of live electronic music concerts and Dj sessions by national and international Djs will make up the Bowers & Wilkins Sound System programme that for the second consecutive year will be part of the musical event in the Parc del Fòrum from Thursday 28th to Saturday 30th May in the framework of Primavera Sound. Thanks to the loudspeaker and audio innovators Bowers & Wilkins, the site will have a colossal equipment that will bring true studio quality sound to the live festival experience. 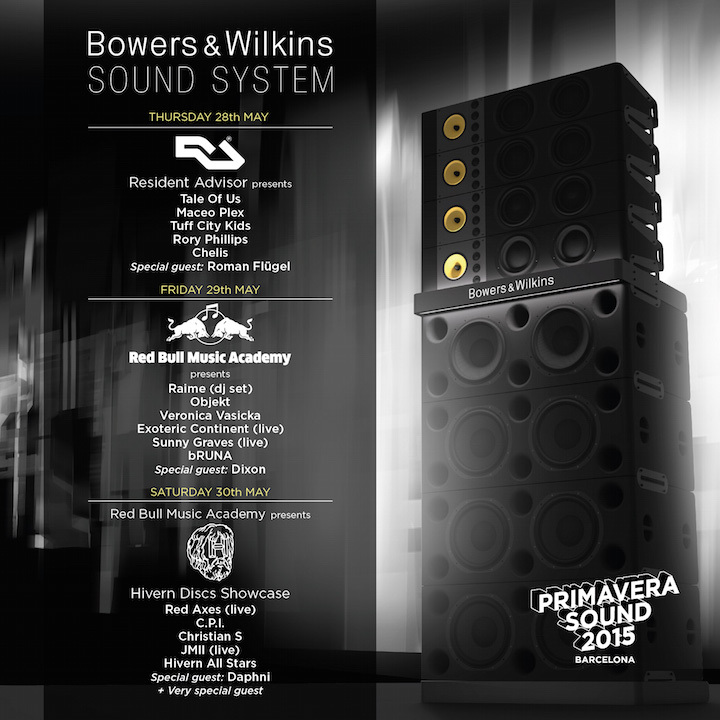 On Friday, with the collaboration of Red Bull Music Academy, bRUNA DJ will be playing at Bowers & Wilkins stage. The rest of line-up is amazing: a session by one of the figures of the moment, Dixon from Germany,two live acts from Spain that really put national electronic music on the map: Sunny Graves and Exoteric Continent. Also Veronica Vasicka, the British duo Raime and Objekt and his dark techno.